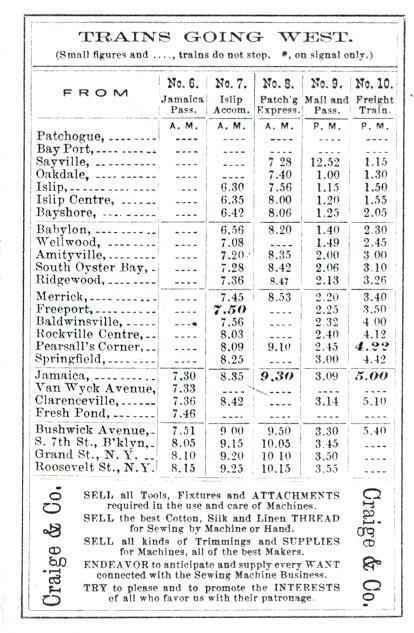 TO REACH THE EAST RIVER FERRIES THEY APPROACHED THE LONG ISLAND RAIL ROAD FOR A TRACK CONNECTION IN JAMAICA AND THE USE OF THEIR LINE TO HUNTERS POINT. 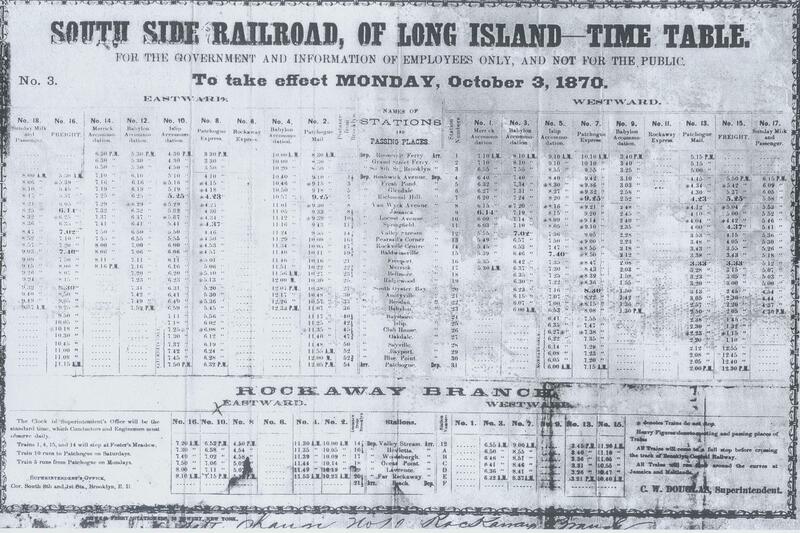 THE OLDER LINE REFUSED AND FOILED ATTEMPTS BY THE SOUTH SIDE TO USE THE BROOKLYN CENTRAL & JAMAICA AND TO PURCHASE THE NEW YORK & FLUSHING RAILROAD WITH WHICH IT WOULD HAVE CONNECTED AT LAUREL HILL. 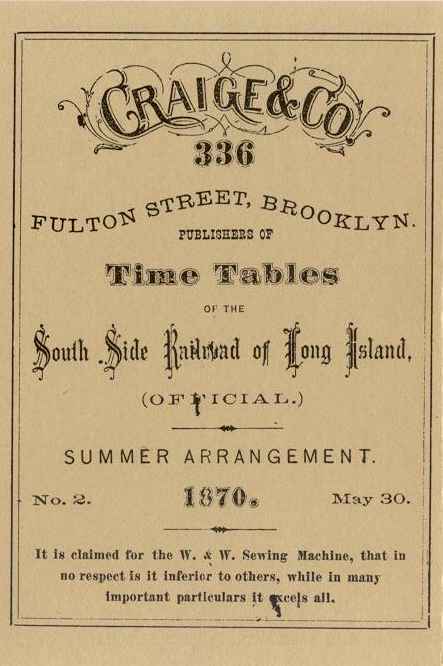 THUS THE DECISION WAS MADE TO BUILD THROUGH BUSHWICK TO SOUTH EIGHTH STREET WILLIAMSBURG. 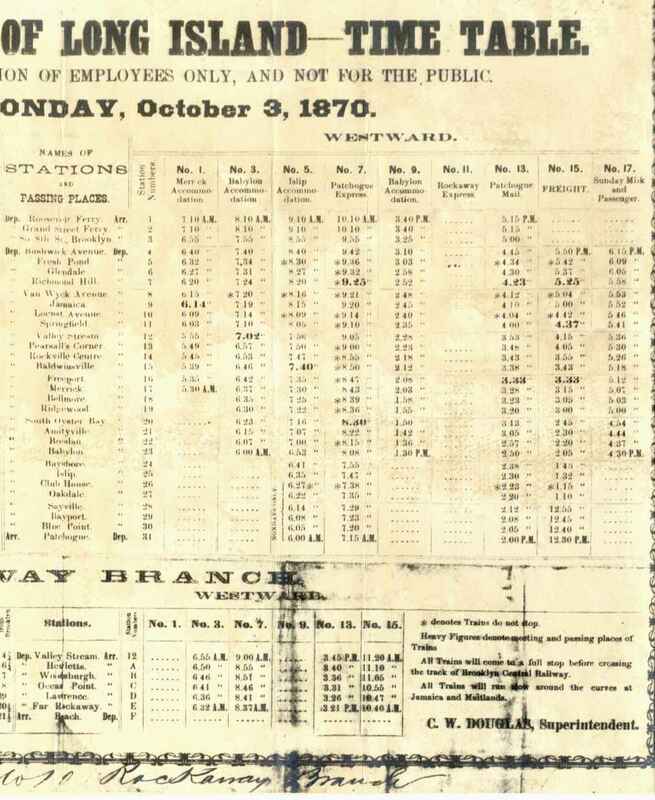 ON OCTOBER 28, 1867 REGULAR SERVICE BEGAN BETWEEN JAMAICA AND BABYLON. 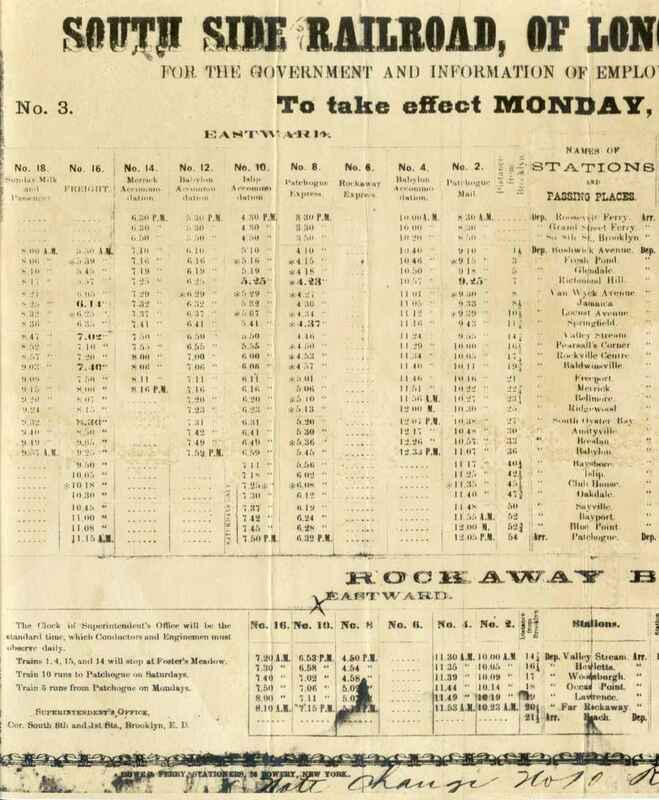 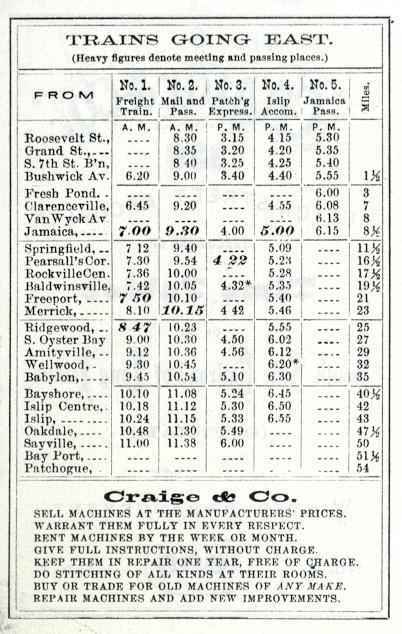 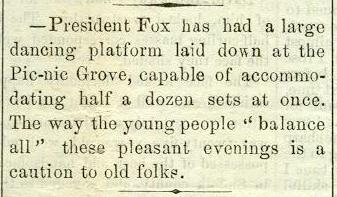 ON JULY 18, 1868 SERVICE WAS EXTENDED WEST TO BUSHWICK AND ON NOVEMBER 4 TO THE EAST RIVER. 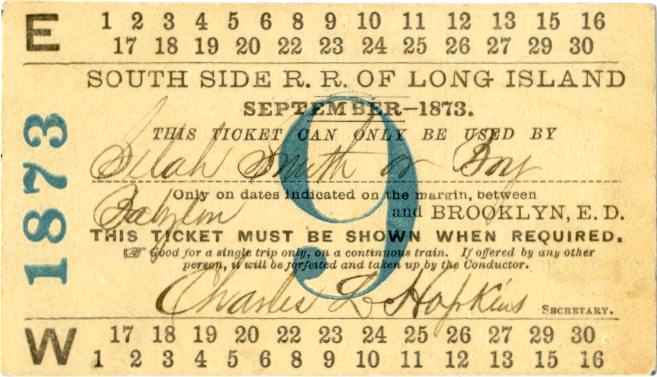 AS THE CITY OF BROOKLYN WOULD NOT ALLOW STEAM, WEST OF BUSHWICK HORSES PULLED THE CARS INDIVIDUALLY THROUGH THE STREETS TO SOUTH EIGHTH STREET. 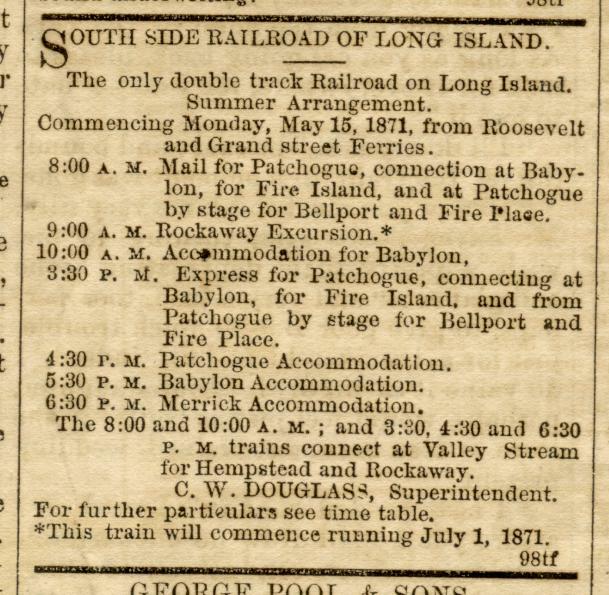 IN DECEMBER 1868 SERVICE BEGAN TO SAYVILLE - IN APRIL 1869 TO PATCHOGUE. 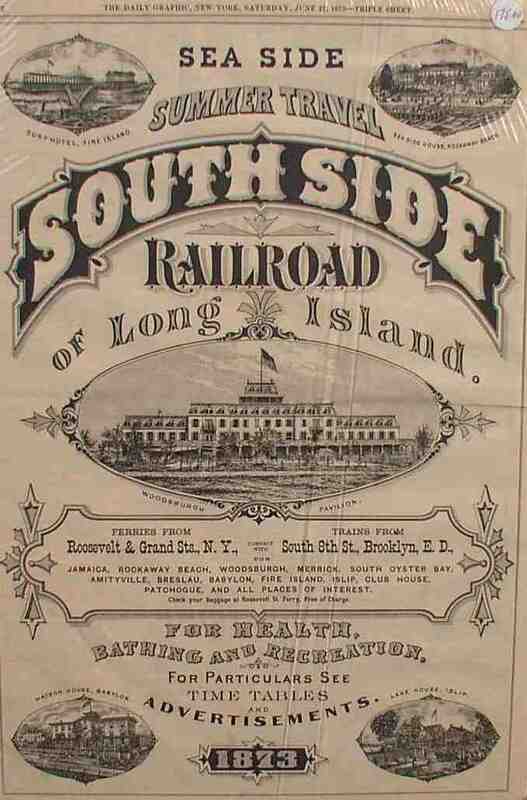 IN JULY 1869 THE FAR ROCKAWAY BRANCH RAILROAD OPENED AND STEAM DUMMIES REPLACED HORSES WEST OF BUSHWICK. 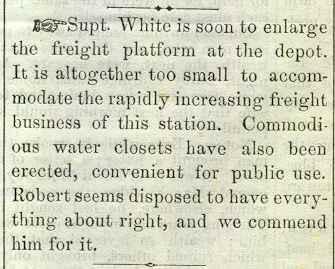 IN FEBRUARY 1872, THE PURCHASE OF THE WESTERLY PORTION OF THE NEW YORK & FLUSHING HAVING BEEN ACCOMPLISHED, A FREIGHT DEPOT WAS OPENED AT HUNTERS POINT. 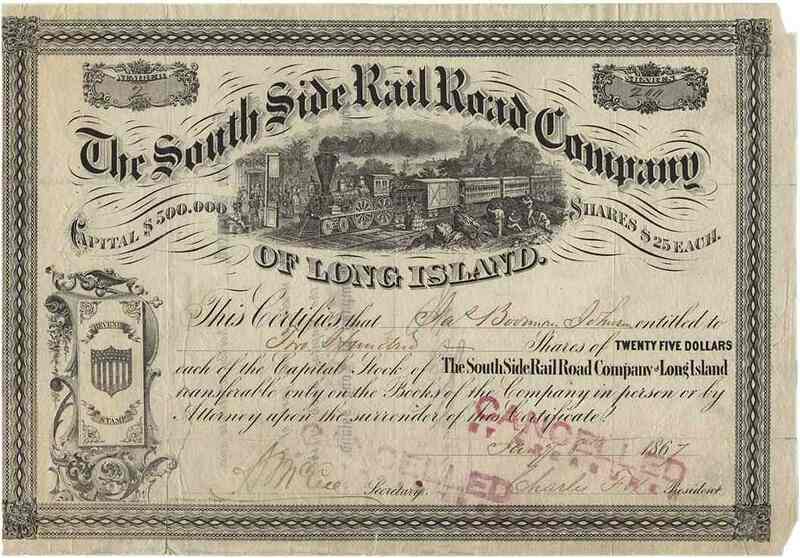 RAILROAD COMPANY, ADOLPH POPPENHUSEN et al. 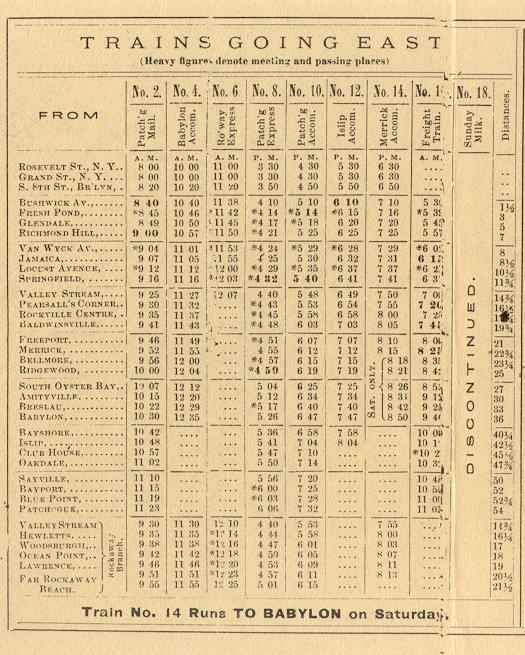 VALLEY STREAM WAS NOT YET A STATION. 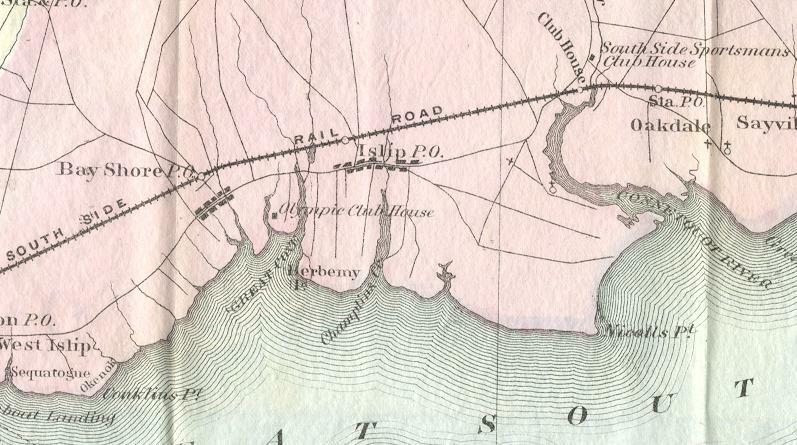 ISLIP CENTRE MAY HAVE SERVED THE OLYMPIC BOAT CLUB AT THE FOOT OF SAXON AVENUE. 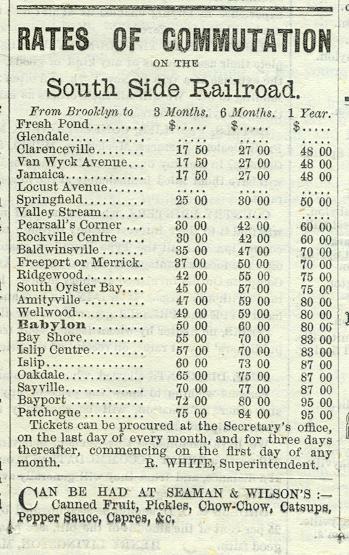 VALLEY STREAM AND THE FAR ROCKAWAY BRANCH RAILROAD APPEAR. 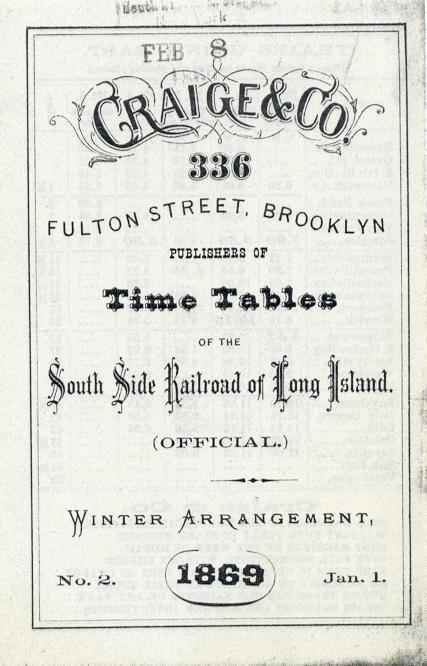 WAS LOCATED ON FLUSHING AVENUE AT ABOUT 52nd STREET. 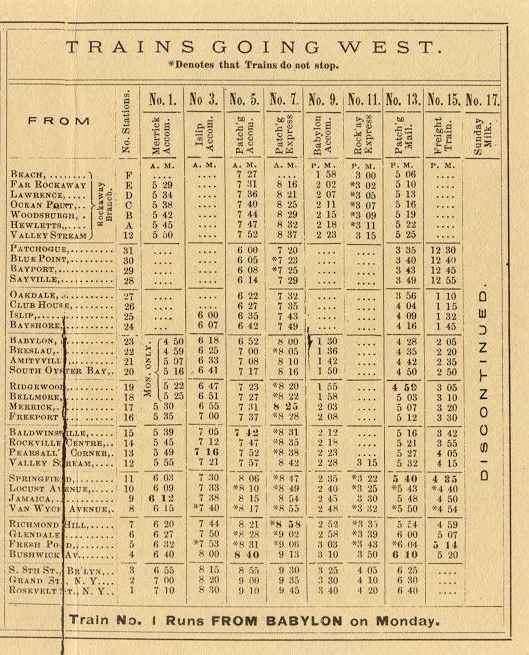 THE 1873 COLTON MAP SHOWS THAT AREA WHICH WAS KNOWN AS "EAST WILLIAMSBURG"
55th STREET - FURMAN AVENUE, AND 54th STREET - GARRISON AVENUE. 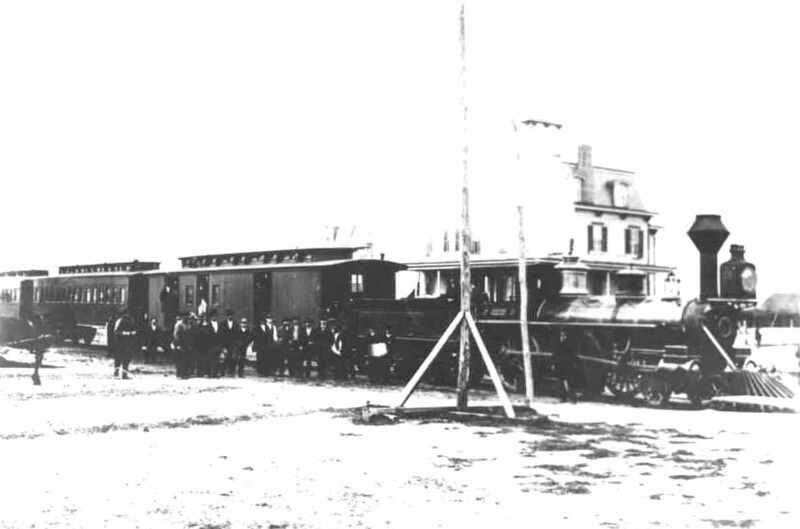 MACHINE AND DERAILS WERE REMOVED IN 1941 AND STOP BOARDS REPLACED THE SIGNALS. 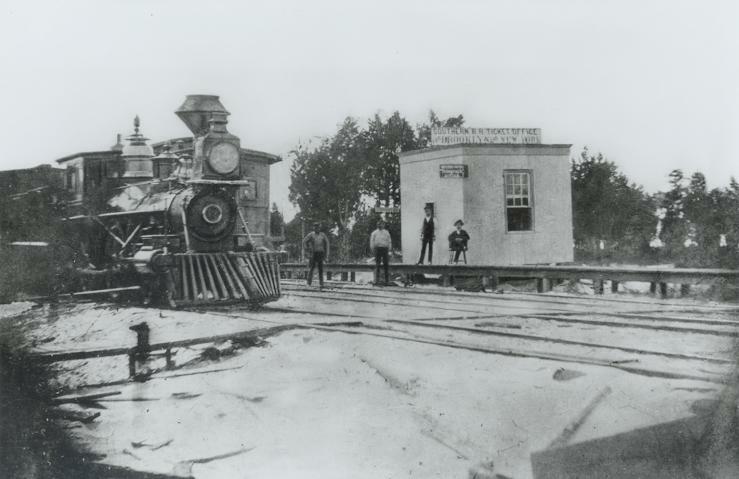 THE FREIGHT HOUSE IN THIS PHOTOGRAPH. 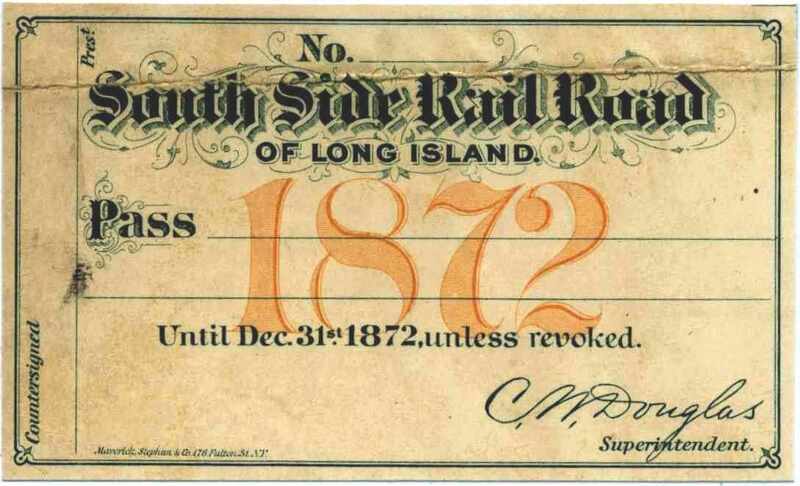 1892 THE VILLAGE NAME BECAME ROSEDALE.